i have spent all day in bed. dreaming of spring. historically, spring is a difficult time for me. the stripping of layer upon layer upon layer upon layer of clothing is abrupt here in manhattan. that being said, spring in the city is unlike anything you can imagine. the city is reborn, changed, and everyone comes out to play. as of now, my number-one-must-have-accessory for the impending (i know, i know it's still like two months away, but a girl can dream) spring season: metallic gold sperry topsiders from jcrew. hoo-ahhh, yes please! today dr. bob compared regular eating to driving along the highway in texas. he said, can you tell me the difference between mile 209 and 541? no? well, that's what regular eating is like--it all kinda looks the same. yes. texas is flat. and much of it looks the same. and it's not exactly scenic (well, not always). 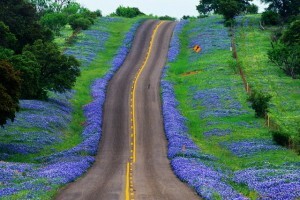 but oh how i'd love to see the bluebonnets growing along the highway right now.